Den 17 september håller Dr. Cecilia Belej från Institute of Research in Art and Culture "Dr. Norberto Griffa" National University of Tres de Febrero i Argentina, en öppen föreläsning om fotograf Annemarie Henirich konstnärskap och fotografi. Den öppna föreläsningen är ett samarbete mellan Centrum för Modevetenskap och Enheten för Filmvetenskap. Courtesy of the Annemarie Heinrich Archive. The Research Institute in Art and Culture "Dr. Norberto Griffa" from National University of Tres de Febrero is currently cataloging and preserving the photographic Archive Heinrich-Sanguinetti, which is composed of around 100.000 photographs starting in the early 1930s. The purpose of this open lecture is to set Annemarie Heinrich’s (Darmstadt, Germany, 1912-Buenos Aires, Argentina, 2005) work as a fashion and celebrity photographer under the limelight, and to explain the process of archival construction and preservation of her cultural legacy. Like many Europeans escaping the consequences of WWI, she migrated with her parents from Germany to Argentina at the age of 14. They settled in Buenos Aires, and very soon she started working as an assistant in several photographic studios ran by Germans. Owner of an exquisite taste for light and aesthetics, she started working as a photographer at her family’s humble house out in the city suburbs, by 1930. Later on, she opened an important studio in the center of Buenos Aires, were she specialized in portraits of celebrities and fashion magazines. Everyone—from Evita to Marlene Dietrich—posed for her camera. 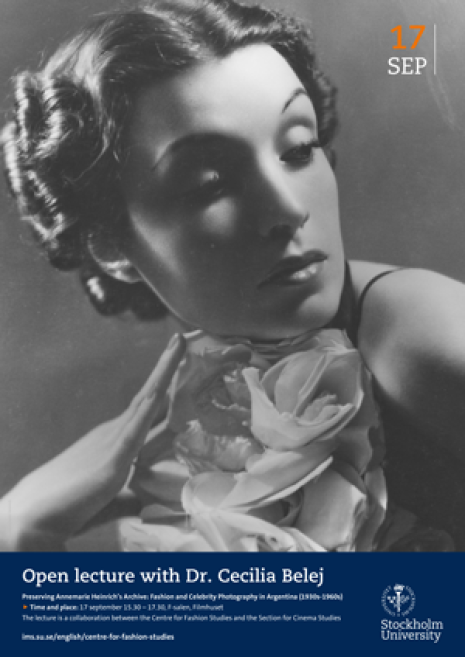 The most famous Argentinean actresses were captured by her lens; Mirtha Legrand, Graciela Borges, Isabel Sarli, as well as famous writers such as Julio Cortázar and Jorge Luis Borges. She was also in charge of Argentina’s most important entertainment magazine covers, i.e. El Hogar, Radiolandia and Antena. Her work is present in many art museums. Cecilia Belej is a research fellow at the Institute of Research in Art and Culture “Dr. Norberto Griffa,” Universidad Nacional de Tres de Febrero in Argentina. She received an MA in Latin American Art History from IDAES-UNSAM, and a Ph.D in History from Universidad de Buenos Aires, in Argentina. Her research interest focuses on the political uses of mural painting in Argentina in the ´30s and ´40s. She currently teaches Social History at the Faculty of Social Sciences, Universidad de Buenos Aires.